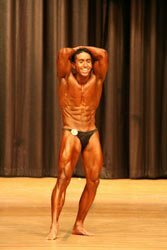 Beginner's Guide To Natural Bodybuilding Competition: Disseminating Misconception From Reality! Most men cringe at the thought of being on stage at a bodybuilding competition. Well, I'm here to tell you, no more do you have to be this gargantuan monster to compete. Here's a guide for the novice to get you on stage and winning. Learn more. Most men cringe at the thought of being on stage at a bodybuilding competition. Well, I'm here to tell you, no more do you have to be this gargantuan monster to compete. The key to natural bodybuilding is having good proportions, symmetry, muscularity and conditioning. Most important though, is conditioning. Time and time again competing and watching local bodybuilding shows, I am here to tell you that if you just come in good shape (conditioned) you will place well and have a good shot at winning! I am referring to amateur competition and competing for the first time as a novice, teen and even open division competitor. For those of you interested in just competing for kicks and doing well out your first time, you can skip down to the 8 guidelines down below or you can just read the rest of this article for your benefit of learning. The most important elements for you are getting down to single-digits body fat 9% or less (lower the better) and perfecting your mandatory poses and having some help with the competition tanning product application. The most important 2 elements for you are conditioning and posing. Place Well And Have A Good Shot At Winning! 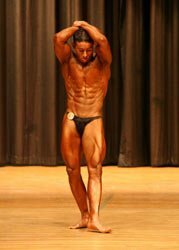 However, for the remainder of this article, I will provide a comprehensive approach to the aspiring natural bodybuilder who wants to not only do well, but be the best he can be in embodying the key elements of being successful in natural bodybuilding competition. Genetics will ultimately place a limit on your progress, however, you will never know how far you can go unless you try. Here is the underlying logic to success in a bodybuilding show. First, if one is past puberty (18 or older) it takes years of training to induce significant gains in muscle hypertrophy (Malina et al., 2004; Pfeiffer & Francis, 1986) and there is a clear non-linear relationship with strength and muscle size (Sale, 1988). At first, as strength increases so does muscle size, but after these initial adaptations (i.e. 6-12 weeks), strength gains become increasingly difficult, but more increasingly difficult are the muscle mass gains after the initial growth spurt (Sale, 1988). Muscle size is in large part determined by genetics (Brooks et al., 1996) and training done during years of puberty when physical growth is most intense (Malina et al., 2004; Pfeiffer & Francis, 1986) and thereafter (20-30 years of age) (Lexall et al., 1988; McArdle et al., 2001). At age 30, muscle size begins to decrease (McArdle et al., 2001), however, between 20-30 years of age, the rate of increase in muscle size is not as great relatively as in late adolescent years (16-19 years of age) (Malina et al., 2004; Pfeiffer & Francis, 1986). Several studies have shown that fiber composition is genetically determined.... Genetics, then, exerts a strong influence on the ability to gain strength, but a good training program can allow you to reach your capacity within a genetically-determined 'performance envelope' (p. 393)." This is not meant to discourage, but to report the facts of science. Everyone is different, so train hard and do what you have to do to be your best. "All champion bodybuilders have mesomorphic characteristics. If they didn't, they could not have made it to the championship level. Someone who is largely ectomorphic or endomorphic does not have the genetic makeup to become a champion bodybuilder. He can certainly improve his physique and, in some cases, dramatically transform this body. But to reach the top of any sport, genetics plays a role to some degree. Knowing your body type will help you design a training and nutrition program appropriate for your unique physique (p. 18)." Even if one attains maximizing muscle hypertrophy (as big as you can genetically get), this is only half the battle. They still have to be able to nail conditioning, which in a nutshell is the capability to shred body fat to levels near 3-5%. So the question becomes, which approach do you go for? Size or conditioning? Well here comes some insight into this contest prep dilemma. Even if one is big on stage, if body fat is not low enough, they will look smooth and not as muscular (Hansen, 2005). For someone who doesn't have great size, but is absolutely shredded, they will look bigger on stage because they are harder and more densely packed (Hansen, 2005). Hypertrophy, This Is Only Half The Battle. What is expected is that one gets as close to looking like an anatomy chart as possible. This is the most critical element in doing well in a bodybuilding show, particularly as a novice and even as an open competitor. Also, be aware that the amount of muscle one can pack onto a frame is determined by height and genetics (Brooks et al., 1996; Malina et al., 2004). Height influences the amount of muscle fibers and length of muscle one has. The longer the muscle, the more potential for growth. Taller individuals have an advantage in that they have more muscle available to them to hypertrophy. The shorter an individual, the less muscle is available to hypertrophy. And if we are talking about short stocky bodybuilders, this is more of an illusion because short guys will typically look more compact. And also, if bodyweight is too high for a certain height (5"8 180-200 lb of pure muscle), either this person is the cream of the crop genetically or pharmaceutical assistance is evident (Kouri et al., 1995). Remember, bodyweight can only go so high for a certain height at body fat percentages of 3-5% (Kouri et al., 1995). The amount of muscle mass we can carry drug-free is chiefly determined by genetics, but also from training. Bodybuilder physiques are definitely influenced by body types as well. Mesomorphs have a clear advantage in competition in terms of muscle denseness and size, ectomorphs do as well in terms of conditioning and low body fat levels, endomorphs have it a little more difficult because although they can pack good muscle size, the capability to show this muscle with low body fat levels is difficult (Hansen, 2005). These 3 body types have associated metabolic rates as well (Hansen, 2005). Ectomorphs have the highest, with mesomorphs next and last would be endomorphs (Hansen, 2005). However, keep in mind that most people are neither 100% one, they are typically a combination of them. Nonetheless, the key to maximizing one's potential is to train as needed for your body type to first of all, be able to come to a contest well-conditioned. Next would be to establish proportions that are very aesthetic for your body type. For more massive bodybuilders, hitting poses that show mass and if arms are impressive enough, hitting straight arm poses would be to your advantage. For smaller bodybuilders, staying compact and perhaps showing the disappearing waist would be to your advantage. What I mean by disappearing waist is, the ability to turn your torso on various poses making your waist appear smaller. This adds a big advantage to your proportions by making your upper and lower body appear bigger. Aesthetic For Your Body Type. With all things being equal (size and conditioning), bodybuilding is a sport of illusion. The ability to show your strengths and hide your weaknesses can make a difference in placing down or up a few spots. Good proportions entails having a wide back (strong lats) and small waist (great conditioning), having the biceps be equally as big as the calves and having all muscle groups developed (Hansen, 2005; Willoughby, 1970). Symmetry involves having both sides (i.e. right and left arm) being as close to equal as possible (Hansen, 2005). Muscularity involves having striated and dense muscles. However, the most important component in natural shows is conditioning. This involves having a low body-fat percentage, which allows the muscle's to be seen with more clarity. For a better idea of what it would take to compete, simply look online for local competitions in your area and attend a show as a spectator. The shows are very affordable with a gate cost typically ranging from $10-20 for the prejudging (morning show) and $15-30 for the finals (evening show). Don't be surprised if you see some men on stage who don't look the part at all, this is typical of most shows. You will also likely see some men in phenomenal shape on stage as well with many being in-between. The bottom line is that anyone can compete in a bodybuilding contest. It is simply a matter of setting fitness and health goals for yourself and working towards those goals. In my opinion, a bodybuilding contest is nothing more than a reward at the end of a training period. A bodybuilding contest is a landmark event that demonstrates your wonderful achievements in health and fitness. If I were to recommend a book and movie for bodybuilding, I would recommend the 2 books: Natural Bodybuilding by John Hansen and The New Encyclopedia of Modern Bodybuilding by Arnold Schwarzenegger and the DVD Pumping Iron. Although natural bodybuilding is somewhat different, this movie is a nice documentary of the training and competition experiences of many bodybuilders of the 70's and it is also very motivating! Water intake before a contest has been a debatable issue for many years in bodybuilding. In fact, it's been said that one has to feel their worst to look their best. This is completely and utterly not true. To be your best, you have to look and feel your best. This comes from eating very healthy, training smart and hard and believing in yourself, even when nobody else does. As far as water intake is concerned, I drink plenty of water and stay hydrated. Being dehydrated is very unhealthy for the body and is a prime example of doing it the wrong way. Front relaxed, left/right side relaxed and back relaxed. Front double biceps, front lat spread, right/left side chest, right/left side triceps, rear lat spread, rear back double biceps, most abdominal and most muscular. Learn all these poses properly and practice these poses often until they become second nature to you and you feel relaxed and they come natural to you. This will take months of practice. This aspect of training involves training in two particular ways. First, training with heavy weights to stimulate muscle size and density and second, training with high-volume stimulating muscle shape and form. The heavy training will consist of major muscle group lifts such as the squat, leg press, bench press, pull-ups, and deadlifts utilizing a repetition range from 6-10 reps, and sometimes going 2-5 reps with longer rest periods (~1-3 minutes). Do not concern yourself with how much your peers lift or what you read in a magazine. Instead, concentrate on making personal improvements in your own strength. I like to gauge strength in relative terms instead of absolute terms. Improvements In Your Own Strength. In other words, a 220 lb. man who can bench press 300 lb. is actually weaker than a 160 lb. man who can bench press 225 lb. This was determined and proven true simply by dividing the amount of weight lifted by one's bodyweight (i.e. 225/160 = 1.4 vs. 300/220 = 1.3). On-stage the 160 lb. man will look more impressive because pound for pound, he is stronger. And trust me, I've competed before and beaten men who were over 200 lbs. I weigh a mere 160 lbs, but with my strength being as it is, my muscles take on a more impressive and stronger look on-stage. The high-volume training consists of training the same major muscle groups and also the minor muscle groups with higher repetitions (8-12) and lighter weights with short rest periods (30-45-seconds). This mode of training creates muscle shape, definition and tone. It is not by some magical effect that muscle's become defined, but rather, it is simply the high-caloric cost of this type of training that burns fat more effectively than the heavier lifting. Both modes of training are necessary to create an optimal physique for natural bodybuilding. One should resistance train 2-4 days/week. 2 days being minimal, 3 being optimal, 4 being a little better than 3. This mode of training involves standard aerobic exercise to make the body a more efficient fat-burning machine. Not to mention, it will enhance your quality of life and longevity. Too often many aspiring bodybuilders make the mistake of thinking aerobic exercise makes muscles small and they just avoid this kind of exercise all-together. This is simply a mistake to avoid this kind of exercise. Actually, aerobic exercise will strip away the fat covering those muscles, which will create the reality of having bigger more defined muscles. The type of aerobic training that is best for bodybuilding would be high-intensity interval training (HIIT). For example, a typical HIIT workout would entail maybe riding on an exercise bike pedaling very fast for 30 seconds (i.e. 100 revolutions per minute [RPM]) and then pedaling slower (i.e. 60-70 RPM) for a 60 second rest period. You would repeat this cycle perhaps 10 times, which would equate to a 15 minute high-octane fat-burning workout. Now, be aware that this mode of training is very intense and one should listen to their body and not overtrain. In other words, perhaps 2-3 HIIT workouts per week would suffice. 1-3 HIIT workouts per week. For the other aerobic workouts, one could train at a moderate-to-low intensity. These lower intensity cardio workouts also burn fat and allow the body to recover when muscles may be sore. Effective cardio typically lasts from 30-60 minutes with 30-minutes being minimal, 45-minutes being optimal and 60-minutes being maximal. If trying to get lean, one should perform aerobic exercise 3-5 days/week. 3 days being minimal, 4 days being optimal and 5 days being just a little better than 4. Effective cardio typically lasts from 20-60 minutes with 20-minutes being minimal, 30-40 being optimal and 45-60 minutes being maximal. The reason for the range in minutes is indicative of everyone having different bodytypes and corresponding metabolic rates. Ideally, doing the least amount of cardio that provides the most bang for the buck would be best. Having good flexibility is absolutely important in longevity in fitness and bodybuilding. Being flexible reduces risk of injury and prevents overuse problems from exercise. I have taken yoga classes and I absolutely love them! They not only enhance body flexibility but they also train the mind and you learn how to connect the mind and body together as one. This is really what bodybuilding is about. It is truly a science in maximizing the body's ability to function and move with greater ease in everyday living. Additionally, yoga is great for improving body control, balance and endurance. The poses in yoga are so ideal for bodybuilding. They teach the artistic side of posing that is so lacking in today's bodybuilding shows. It is one thing to have a great body, but it is another more impressive thing to make a great body move with grace and fluidity. Eating right is more simple than one would think. The debate of all calories being created equal or not certainly leads many to frustration over what the percentage of carbs, proteins and fats should be. However, the one concept that holds true is that if you burn more calories than you take in, one will lose weight. It is this simple. However, the process can be complex. My caloric breakdown ranges from carbs being ~55-65%, protein 20-30% and fats 10-20%. The key is to eat high-quality foods (rich in vitamins, minerals and antioxidants) and to reduce low quality foods (high in calories but low in vitamins, minerals and antioxidants), carbs being ~45-60%, protein 20-35% and fats 10-20%. If there is one book I would recommend on nutrition it would be Volumetrics by Barbara Rolls. This was actually a New York Times best seller and is a great book to get you started in the right direction. The Key Is To Eat High-Quality Foods. When preparing for a contest, contest preparation should range from 8-14 weeks. However, the more out-of-shape one is, the longer this time period will become. I have seen many people preparing for a contest 20-24 weeks out! This is simply a mistake by letting oneself get that out-of-shape. I believe staying within striking distance is the key to a more healthy and less painful contest preparation period. This year, I prepped only 8 weeks out for my first show, dropping from 168 lbs to 160 lbs. The key was being fit in the off-season and then making subtle changes in contest season. The body doesn't like extreme change, it thrives on balance, so subtle changes work best. Everyone is different, however, ideally 6-8 hours of sleep a night is what is needed for optimal recovery and rest. Rest is probably more important than the training, since the body does it's repairs on the muscles at night during sleep. The key is to get good quality deep sleep. One person may only need 6 hours of sleep whereas another person may need 8 hours of sleep. The key is to get enough sleep to where you are not tired during the day or fatigued more than normal. The Key Is To Get Good Quality Deep Sleep. Posing trunks and tanning oils are a necessity if one is to compete. A great website one can go to for these supplies is Bodybuilding.com. This is simply the #1 source of information on bodybuilding. 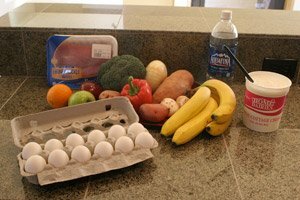 Natural bodybuilding can be a very healthy endeavor if done the right way. Natural bodybuilding is about learning how to train smarter, eat healthier and relax more. It is a delicate balance of mind, body and spirit merging together as one to create a healthy and highly-functional person. Butler, G. (Producer/Director). (2003). Pumping Iron: The 25th Anniversary Special Edition [Motion picture]. (Available from Home Box Office, Inc., 1100 Avenue of the Americas, New York, NY 10036). Brooks et al. (1996). Exercise Physiology: Human Bioenergetics and Its Applications. Mayfield Publishing Company, Mountain View, CA. Lexell et al. (1988). What is the cause of ageing atrophy? Total number, size and proportion of different fiber types studied in whole vastus lateralis muscle from 15-to 83-year-old men, Journal of Neurological Sciences, 85, 275-294. Malina et al. (2004). Growth, Maturation, and Physical Activity. 2nd edition, Human Kinetics, Champaign, IL. Pfeiffer & Francis (1986). Effects of strength training on muscle development in prepubescent, pubescent and postpubescent males, Physician and Sports Medicine, 14, 134-143. Sale, D.G. (1988). Neural adaptation to resistance training, Medicine and Science in Sports and Exercise, 20(Suppl 5), S135-S145. illoughby, DP. (1970). The super athletes. AS Barnes, South Brunswick, NJ.